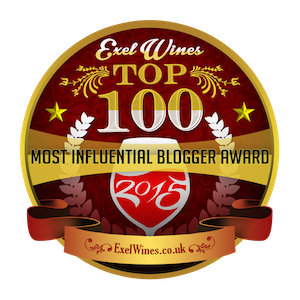 In case you've noticed... the blog design here on Come for the Wine has been going a bit schizoid. It's not you...it's me. I accidentally deleted my original template and have been experimenting to get things back together again. Although I now realize all those experiments were going out LIVE!! Come for the Wine is undergoing some design changes off-line, and the new site will be launched soon. In the meantime, I'll be using this template design, with a few tweaks here and there...but no radical changes as before. My bags were packed. My dollars changed to Kuna. The plane was at the gate. My seat belt was fastened and I was on my way to Zagreb Wine Gourmet Weekend. Then I heard the dreaded ''Um, This is your captain speaking... "
We were told we would have a one or two hour delay while they replaced a fuel pump on an engine. So I ate my lunch (NOTE: Never board a flight without your own food and water supply) and chatted with my German seatmates auf Deutsch--a skill I somehow dredged up from a long neglected language sector in my memory banks. Then two hours turned to four, to six, to eight. (But at least they let us off the plane after the first two hours) Then we were told the flight would be canceled and we would be getting a replacement aircraft. In the meantime we all got in line to rebook our connections. Well things got complicated, connections were missed, fare classes were changed. 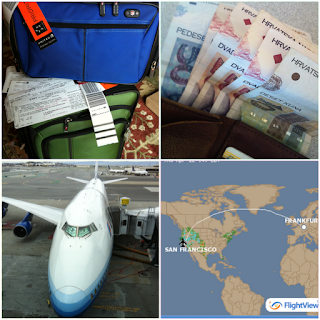 I'll spare you all the details, but when the flight finally left over 9 hours later, I was not on it. 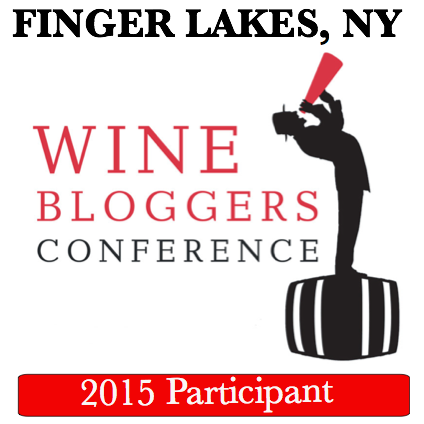 So instead of giving my presentation at the panel event along with Cliff Rames of @WinesofCroatia, Lada Radin and Nenad Trifunović, I participated by twitter and tasted the wines for breakfast along with the other bloggers tasting live via twitter. 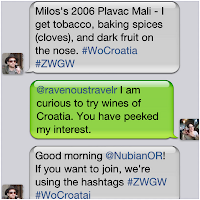 Here is a sampling of the tweets, but you can also search twitter for the hashtag #WoCroatia and #ZWGW to view more. 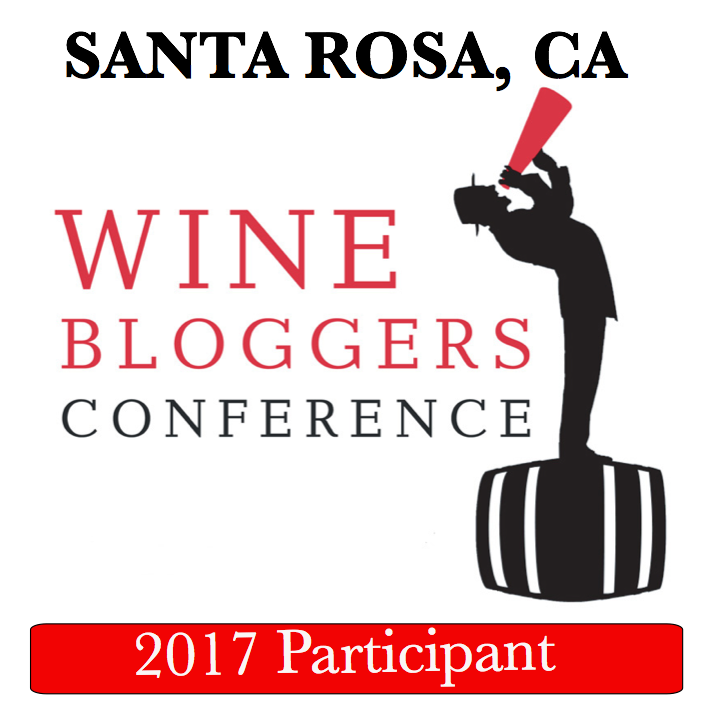 The event turned out pretty great and the power of twitter in wine culture confirmed --heck a sale was made due to the all the tweeting! 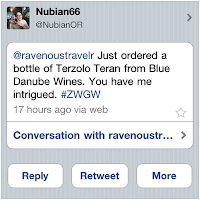 I'd say that's one very compelling reason right there to join the conversation on twitter if you are in the wine business or just interested in discovering new wines. 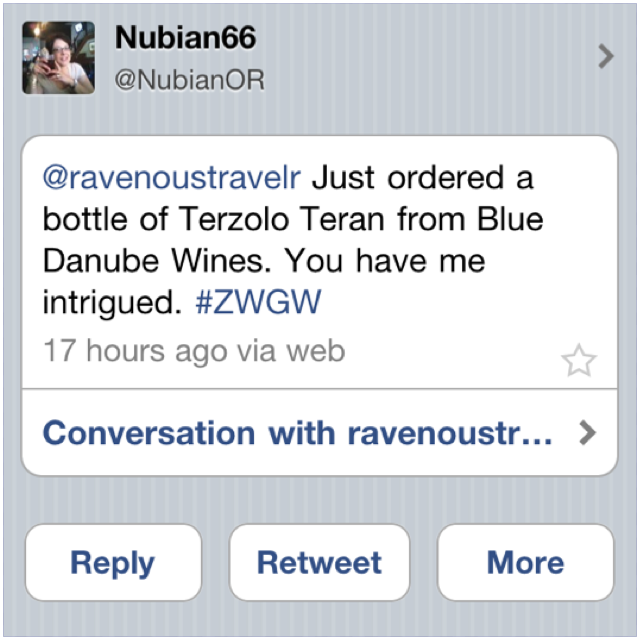 Over the weekend I followed all the #ZWGW tweets and sank into a funk as I saw the wines and fun tweet by before my eyes. Tweets about the Piquentum party and human pyramids and the late night Bibich party. My recommendation if anything like this happens to you --Stay off Twitter--it will only make it worse as you read the tweets of all your friends and colleagues having a blast. Oh the agony. Luckily I had a stash of Croatian wine, Chiavalon olive oil and some Ajvar (albeit store bought) to soften the blow and help me ease my pain. 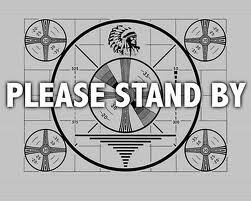 So, I'm sorry I have no pictures or stories to report here, but next time. Next time for sure. 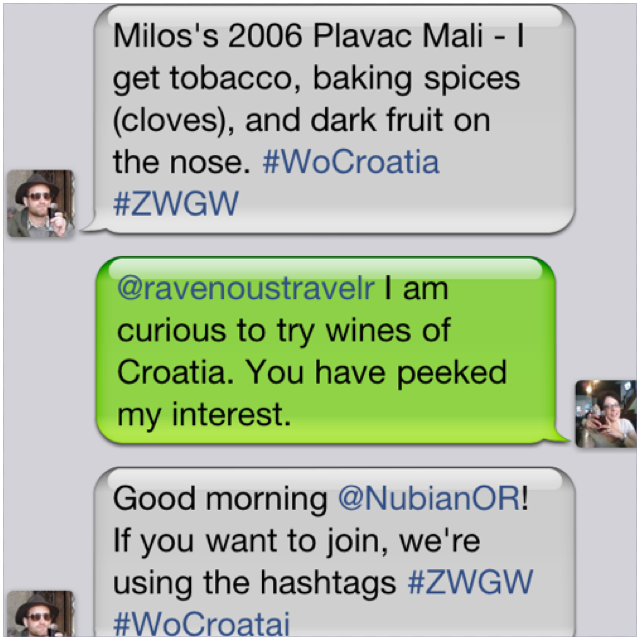 Next weekend I'll be attending the Zagreb Wine Gourmet Weekend where I'll be on a Twitter Tasting Panel moderated by Cliff Rames. 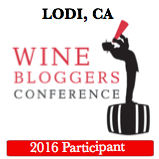 We'll be discussing the power of twitter and the influence of new technologies and social networks on the wine culture and conduct a live twitter tasting with U.S. bloggers and members of the live audience too. It's not too late to jump on a plane and head to Zagreb and join us. But barring that, you can tune in to twitter on Saturday April 14th at 8am PST / 11am EST and follow the hashtag #WoCroatia and #ZWGW12. 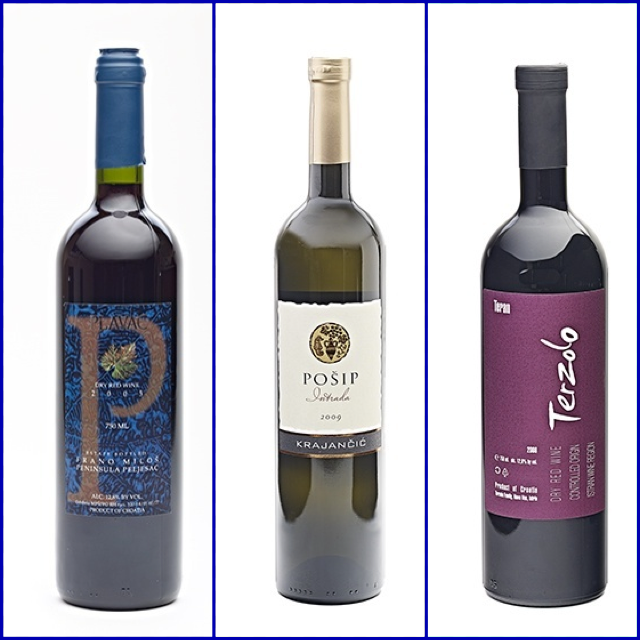 We will be tasting Milos Plavac, Krajancic Posip, and Terzolo Teran. 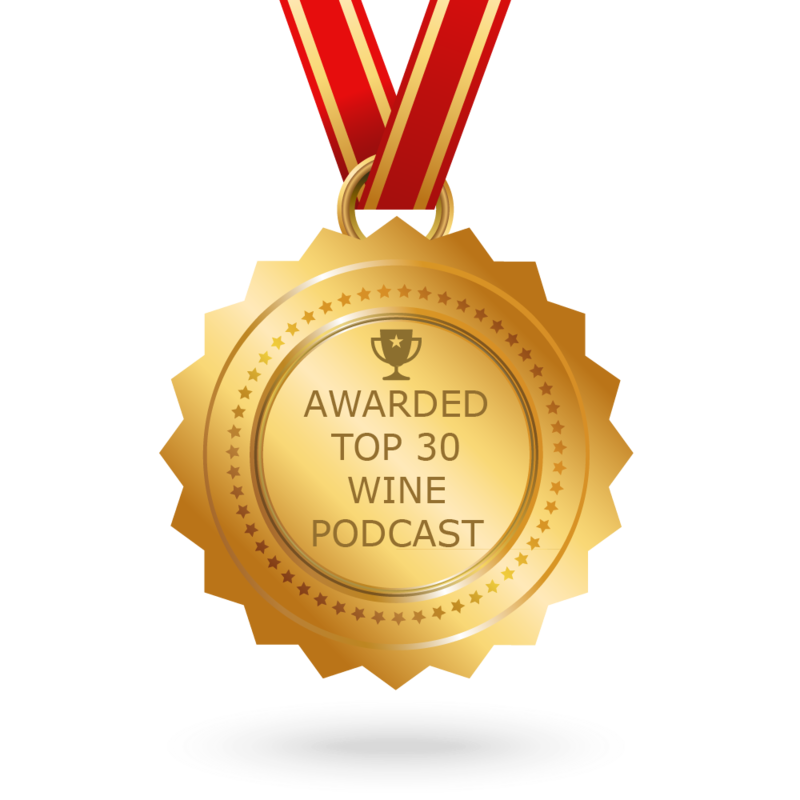 If you'd like to join in live with your own tasting notes you may be able to find the wines at your local wine shop, or you can order them via Blue Danbue Wine. 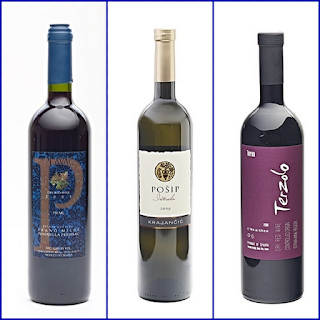 In addition to all the wine and food exhibitors on the show floor, there will be Master Class tastings including presentations by David Gates of Ridge Vineyards and by Ivo Jeramaz of Grgich Hills. Seminars topics include a session with George Taber on The Judgement of Paris. A full slate of films will be screened including the Life on the Douro. You can view the full schedule here. After the Wine Gourmet Weekend I'll be exploring the wilds of Istria (and wifi permitting) tweeting all my finds as we hike the trails, forage for asparagus with wolves and bears, sample traditional rakija recipes, and taste and drink our way around the tiny towns of the region. One of the highlights of the 2012 International Wine Tourism Conference was the Wines of Croatia tasting held to introduce attendees to next year's conference location in Zagreb. Of course this event was one I'd been looking forward to ever since the announcement was made in the conference program. I've become a huge fan of Croatian wines in the last year, and I was excited to hear what others at the conference thought about the wines as they tried them for the first time. 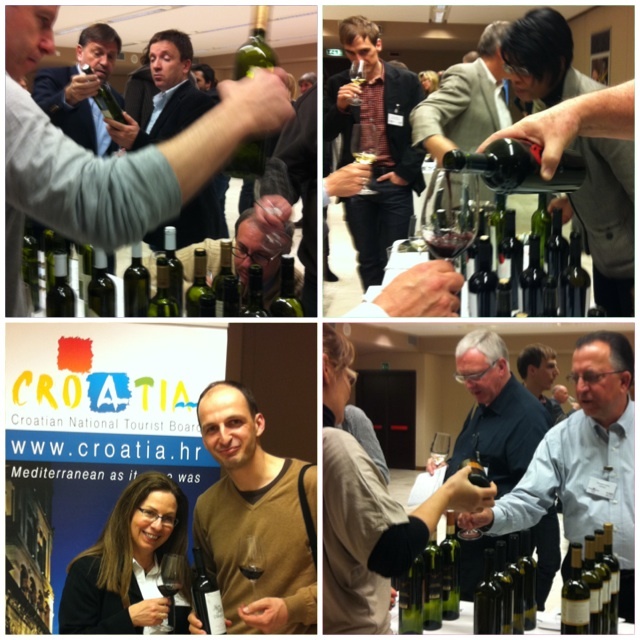 Over 15 wines from the regions of Danbue, Slavonia, Istria and Dalmatia were poured. There were many raves for the whites including the Kozlović Malvazia from Istria and the Iločki Podrumi Graševina Vrhunska. The clear favorite among the reds was the "Donkey" Dingač Placvac Mali from Vinarija Dingač. 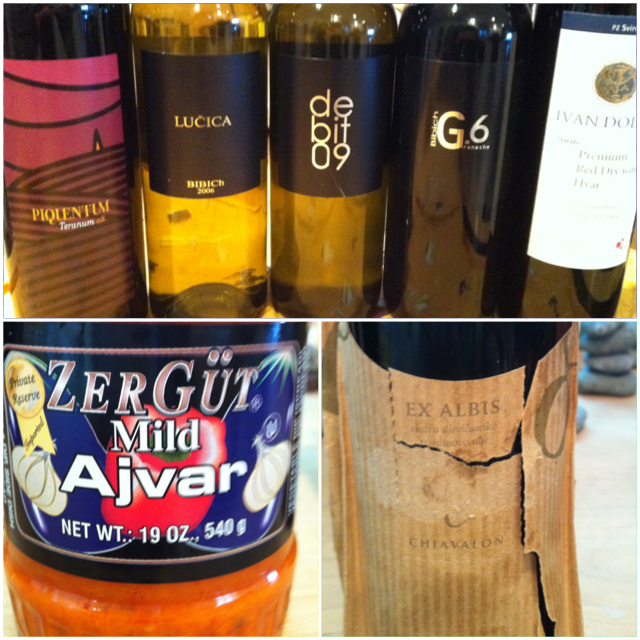 People were quite intrigued by the Dingač and it's distinct briny notes. 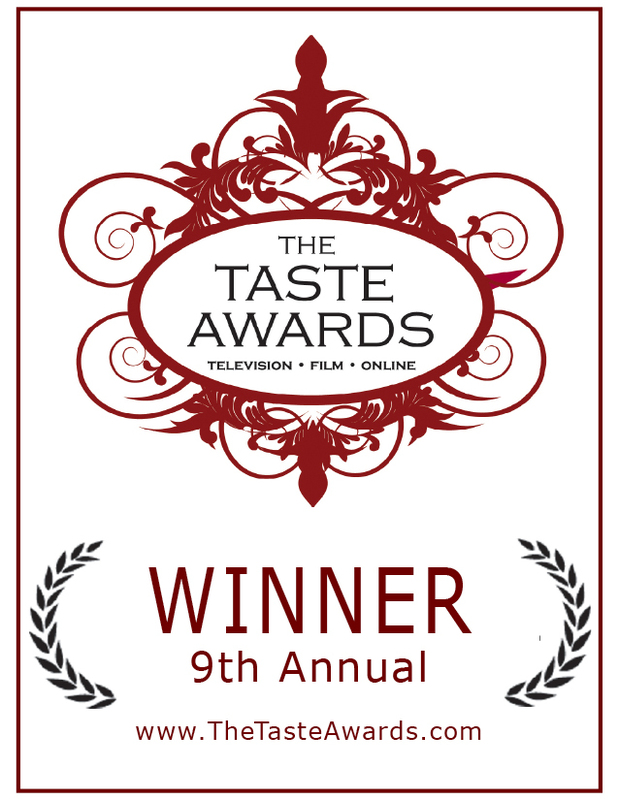 Also the Festigia Merlot was favored for it's balance and rich flavor. 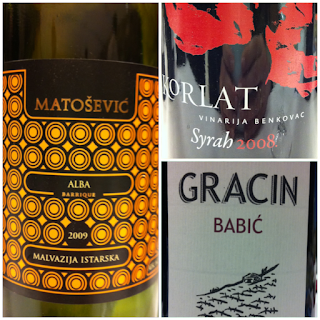 I particularly enjoyed the Gracin Babić, the Korlat Syrah, and the Matošević Malvasija Alba. I was surprised there was no Teran to taste, but that will just give everyone something to look forward to when they arrive in Croatia next year. Next year's conference will be held March 15-17th. March !?! I guess that means my annual Wine Pleasures birthday celebration has ended. But you kids born in March...get it together and apply for the blogger trip.